Bought my $20 six pack of Hopslam and my $11 double-bottle of Hoptimum. They better be fabulous beyond fabulous! I'm gonna need a second job to cover them. It was funny, too, all this hype. Each Total Wine store received only three cases of Hopslam and limited their customers to one six pack per person. The dude in front of me paying brought his unwilling girlfriend in the store just so he could get two. Isn't that insane? I was so close to just buying one bottle, but I caved. Anyway, not tonight for either of these. 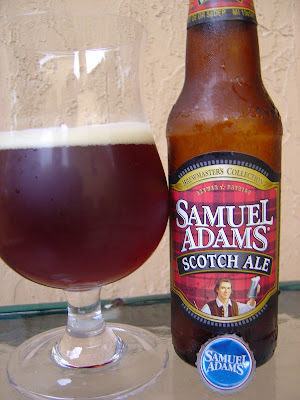 Tonight I'm drinking Samuel Adams Scotch Ale brewed by The Boston Beer Company in Boston, Massachusetts and Brenigsville, Pennsylvania (nothing about Cincy on this one). Typical presentation here, just a red plaid as the background color. I finished the bottle before I read the neck label which says that one of the malts used is a rare peat-smoked malt used in scotch whiskies. Purchase before September, 2011. Malty caramel aroma with a hint of tea, a little sweet. The flavors started out with a big dose of smoke, which was completely unexpected. Remember, I read the label afterward. Roasted and nutty with caramel and wood flavor after that. Very interesting. Bitter and prickly carbonation take turns sparring with your mouth. Nicely balanced on the barely bitter side. The alcohol provides a dry finish and a touch of warmth. Pretty good beer and definitely different. Great review and love the photo. Nice sweat on the bottle! It wasn't even that hot outside, but that is unavoidable, even in January, since I live in South Florida. Thanks for stopping by. I purchased to sixers of Hopslam last night for $16.99 in Orlando. Can't wait to crack one open! That was our price last year. Can't wait for another 20% price hike for next year!